Looking for plastic model ships? Here is a list of the most important manufacturers and their specialties: Tamiya, Hasegawa, Academy, Italeri, Trumpeter, Heller, Airfix, Revell, Bronco, Lindberg etc. Part of my current pile of plastic model ships. Most were found on ebay. Historical accuracy stems from good research and attention to detail. The importance of historical accuracy has shifted over the years. The bar has been raised significantly. Some kits are off in scale, but otherwise good quality. This is more noticeable the larger the scale. Level of detail is not just including details, but placing them right. Many details are not reproduced well at a small scale, so are best left out. This is one of those things that are hard to pin point, but becomes an eye sore when done poorly. What part should be shiny and what looks better matte? Should deck planks be shown on a 1:700 scale battleship? Again, easy to tell when its done poorly. So why would anyone ever buy an old or dated kit? Well, many times there are not a lot of choices. A good example are the age old USS Olympia kits. These kits have been around for almost half a century and go in and out of production every so often. They're old and inaccurate and to pretty awkward scales, but still the only kits of a late 19th century cruiser. If, on the other hand, I'm looking for the German Battleship Bismarck, just about every maker has its own version of it. Now I have the luxury to choose the scale and level of quality I'm interested in and willing to pay for. I typically check ebay before anything if I'm looking for a plastic model kit, whether it's old or new. It pays to shop around though. Sometimes the exact same kit can be found on places like Amazon at a much lower price, so shop around. Ebay is also a good place to start if you are shopping for a particular kit. I've bought a lot of out-of-production kits there at reasonable prices and I've also found currently in-production-kits at bargain basement prices. Here is a list of the most important manufacturers of good plastic ship models. I've tried to hi-lite each with their specialty to make the list more useful. Click the links for more information. Tamiya is recognized for their attention to detail on their models and exceptional fit. Their models usually goes together much easier than most other manufacturers. Academy is also considered a quality brand. They offer several sailing ships, warships passenger liners etc. Among the most well known is their RMS Titanic offered in two scales. Hasegawa also holds a very high standard on their kits. They may not have the precision of assembly as Tamiya has been known for, but offer good value none the less. They were one of the first plastic model kit manufacturers to offer photo-etched brass fittings and details. One very well received kit by Hasegawa, of excellent quality is the Pre-Dreadnought Battleship Mikasa. Aoshima Bunka Kyozai is a lesser known Japanese model kit manufacturer. They make plastic kits and die-cast ships for collectors. Trumpeter doesn't have the excellent accuracy and detail reputation of Tamiya and Hasegawa, but doesn't cost quite as much either. One amazing Trumpeter kit is their 1:200 scale USS Arizona model. Bronco is a relatively young and aggressive company on the plastic kit scene. They are a refreshing in the sense that they are continually releasing new products a lot faster than the established American and European competitors. In general they offer better fit and accuracy than Trumpeter, but not quite to the Japanese standard. Revell - Monogram can trace its roots back to the mid 1950's. Their quality is spotty by today's standard. Largely because some of the models offered were originally introduced in the 1960's. Not only are many of the designs dated, but tooling wear makes for a lot of flash, poor fit and so fourth. Many of their subjects are not available elsewhere and the price is decent, so their kits seems to be selling quite well, all things considered. Revell Germany is today independent of it's American namesake. They used to be the same company but started developing their own kits, independent of Revell USA, in the 1970's. They are often seen as more detailed than their US cousins. I grew up with Airfix, and have fond memories flipping through their catalogs before bedtime as a kid. Not the most sophisticated, but their unique offering has its appeal. Their line of products include some attractive historic sailing ships. Heller has a lot of similarities to Airfix, and were in fact owned by the same company until recently. Both have served a mainly European customer base, and it shows in their offering. As with Airfix, they are maybe most famous for their historic sailing ship models. Lindberg kits are some of the crudest and least historically accurate kits. That doesn't mean they are worthless. For one thing, that in itself has its charm, but more importantly, there are some model subjects that are unique to their line. For instance, the 1:32 scale PT 109 model and the "Blue Devil" Destroyer are relatively easy RC conversions. Lindberg also has the largest selection of pirate ship model kits. Italeri has its strength in WW2 military models in 1:72 and 1:35 scale. They are now taking the lead in highly accurate PT boats, Motor Torpedo Boats, MAS, mini submarines and landing craft. In fact, the number of new kits recently developed is unsurpassed other than by the Chinese manufacturers. They are also offering the Higgins Boat (LCVP) and LCM landing craft. These are the best kits of these subjects so far. This is a smart move by Italeri, as they go very well with their military kits and figures in 1:35 and 1:72 scale. Several kits are reaching the west from manufacturers in the former Soviet Union. 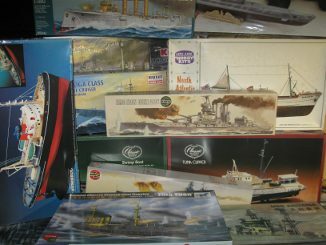 These plastic model ships are of varying quality, but often of rarely seen subjects, and often at reasonable cost. So, all in all, well worth considering.